Last month my youngest son, Buck, was in his high school musical ‘Carousel’—I saw every performance and as a result, every time I walk into the greenhouse and look at all those blooming plants I hear in my head, “June is bustin’ out all oh‐a‐ver!” And if no one is listenin’, I might break forth into song. May and June are the months that give tropical plants and annual flowers in our zone a very good name, which is why so many people enjoy planting their containers during these months. We’re past the threat of frost, it’s still not terribly hot to be planting outside, and you can get your hands on a good selection of plant material. One thing to remember when putting your containers together is to use a good quality container mix like Fafard Complete Container Mix or Miracle Gro’s Moisture Control Container Mix. Make sure your container has good drainage (does it have a hole in the bottom of the container?) and leave room in your summer containers for plants to grow. If you can’t find the exact plants listed here, you can easily substitute with a different Lantana or ivy geranium. Tropical Plumbago—Vivid blue flowers provide a constant display of color from early spring until first frost. This shrubby plant is wonderful to mix with Mandevilla vine for a full sun, low water planting. This color of blue is a nice cool alternative to the many warm colors of summer annuals. Ornamental peppers—Look for interesting names like ‘Black Pearl’, ‘Chilly Chili’, ‘Sangria’, or ‘Purple Flash’. These ornamental peppers produce vibrant color all season long. The deep purple colors of ‘Black Pearl’ and ‘Purple Flash’ serve as the perfect backdrop to bright red peppers. These are sun loving plants that can handle part shade and a little neglect. 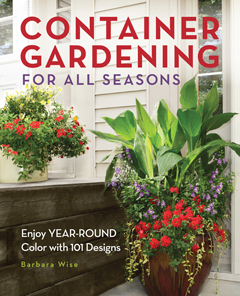 Editor’s Note: Barbara Wise, floriculture director with Southern Land Company, LLC, brings her gardening expertise and experience to readers of House & Home & Garden™. You can now read more of Barbara’s plant musings at bwisegardening.com or follow on twitter@bwisegardens. E-mail your questions to Barbara at barbara.wise@southernland.com.